Why 100 Patient Visits in 30 Days? Serve More Patients: The true joy in life comes from serving you’re your purpose at one hundred percent. An amazing sense of fulfillment comes when you realize your full potential. Take the chiroAcademy Challenge and more patients than you’ve ever served before! Profitability: You deserve to live a life filled with abundance, prosperity, wealth and happiness! How would an extra 100 patient visits per week change financial well-being, quality of life and future wealth? An extra 100 patient visits per week translates into $200,000.00-$300,000.00.00 per year! The World so Desperately Needs You: Our health has never been so poor. Within the last generation, deaths due to chronic disease have risen from 72% to 89%! With ever increasing physical, chemical and emotional stress, subluxations have hit epidemic levels. There has never been a more important time to get your message to more people and save more lives. Take a Leap of Faith: Fear is man’s biggest obstacle to success. It’s a common practice for doctors to rationalize their lack of success: it’s the economy, you don’t understand my town, marketing doesn’t work anymore or I can’t afford it… Is the real reason the fear of failure? Don’t let fear hold you back. Be willing to take a leap of faith. Combine the ChiroAcademy Challenge with your gifts, talents and passion and let Dr. Gandolfi guide you to levels you’ve only dreamed about. This is not a coaching program, management group, gimmicky marketing strategy or hyped up smoke and mirrors program. This is a highly intensive, roll-up-your-sleeves and get to work training program meticulously designed for you to experience Quick, Massive Practice Growth. The chiroAcademy Challenge is designed to grow your practice by an extra 100 patient visits in 30 days. Enough said! This is the fourth time we have put a group of doctors through the program. The program has been systematized and refined to very repeatable process. You will work one-on-one with Dr. Gandolfi as he teaches you the science behind rapid practice growth. Critical areas of focus include: marketing, consciousness, energy, staff, patient education, systems, capacity, accountability and implementation. There are three parts to the training that covers the critical, must know topics related to growing your practice fast. The Intensive Training Phase: 6 weeks of very intensive training, planning and preparation for massive growth. The Implementation Phase: 4 weeks of massive action. This your 30 days in which you grow your practice by at least 100 patient visits. Your Future Phase: 2 weeks of planning and creating systems to insure that your practice growth will not be short lived. Weekly one-on-one 30 minute training sessions with Dr. Michael Gandolfi. Twelve in all. Procedures, planning, patient education, reactivation, head space… dependent on individual needs and recommendations. Average Dr. receives 20-30 hours of chiroAcademy training programs. The chiroAcademy Challenge System: 24 - MP3 training sessions specifically crafted for the chiroAcademy Challenge. These audios are evenly dispersed over the twelve weeks. Who is Dr. Michael Gandolfi? Dr. Gandolfi is a founder of the chiroAcademy. Dr. Michael Gandolfi has practiced for over 28 years. His practice averaged 525-770 patient visits per week. The practice model is a subluxation based wellness practice that focuses on arousing innate so the body can better express itself within the environment. He has been teaching seminars for over 16 years. He has coached chiropractors from 20 different countries over the past 16 years. He is the creator of many sought after programs such as: The Amazing 12 Visit Shift, "Tic"nology, Wellness Marketing, The 13 Secrets of an Extraordinary Life and the Gandolfi Subluxation model. Dr. Gandolfi's method combines the power of communications with innovative solutions that are specifically designed to match with YOUR dreams. Unlike conventional programs that teach everyone the same procedures and scripts, he customizes every program to each individual's goals. "Together we will identify your true chiropractic purpose and passion. Then we will create a "tailor-made" strategic plan to manifest your purpose into reality as we move you and your practice from where you currently are to the state that you want to be." The chiroAcademy Challenge is designed to help you, your staff and your practice express your purpose at 100%. Ayn Rand stated that "most people are satisfied at living at zero." In other word, most people are satisfied with just getting by... just making enough money to pay their bills, just putting in enough effort at work to keep a job, just communicating enough with their spouse to prevent a divorce. Sad but true. Most people are just getting by in life. The good news is, this doesn't have to be you. The chiroAcademy Challenge is a unique process designed so that you can live your life at 100% in every dimension. Add 100 patient visits per week and beyond! After 10 years of thorough development Dr. Gandolfi has created a process that is designed to grow your practice quicker, faster and easier than you’ve ever thought possible. Add just one new patient and it will pay for your entire training. The return on this investment is staggering. Act now to take advantage of this introductory pricing. "Dr. Mike Gandolfi has developed some of the most successful programs in the chiropractic profession. Over the years I have had the opportunity to work with him as a client, a coaching partner, and a business partner. I have learned and implemented almost all of his programs in my practice and I can honestly say that they have never cost me a dime... every program has increased my certainty, my happiness, my practice volume and my income. 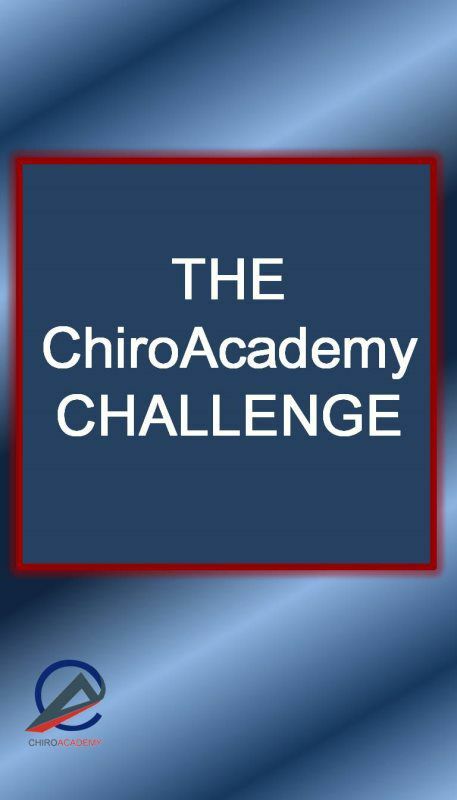 When Mike first told me about the chiroAcademy Challenge I was speechless. I said to him, "You're nuts, Mike, you're going to give these folks all of that?" He didn't even hesitate to say "Yes". If I were to describe the chiroAcademy Challenge in just a few words it would be this... the chiroAcademy Challenge is the best of everything that Mike has to offer in terms of products and coaching all rolled into a 12-week high intensity practice growth program. If you are a doctor who is tired of mediocrity in practice and is willing to roll up your sleeves and put the pedal to the metal for 3 months your practice will grow like it's never grown before... Are you up to the challenge?"